You will also need some disposable chopsticks and an open flame to cook over. I used a gas stove. Makes about 2.5 sticks. Double for 5-6 sticks. “Making the Gohei Mochi!Pour walnuts and sesame seeds into either a food processor or a mortar. I recommend the latter, or a bowl and a blunt bashing object if you don’t have a mortar. It does a better job of releasing walnut and seed oils, making the end product more tasty. However, either method will do. Crush nuts up into fine crumbs. 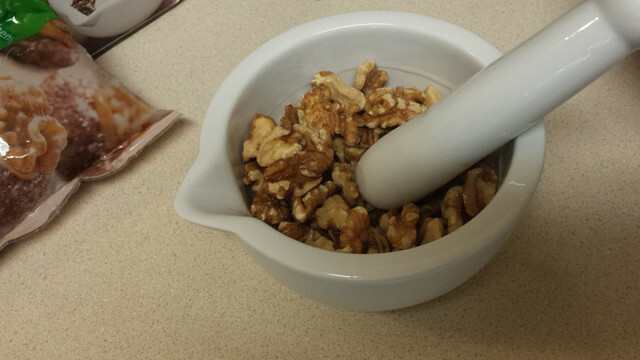 You really want to avoid big chunks of walnuts. Then, add in the miso, mirin, soy sauce, and sugar. Keep grinding until you have a paste. Scoop this out and set aside. Then, put the rice in the mortar and smash that up until it’s really, really sticky. I mean it, it should be obnoxiously sticky. 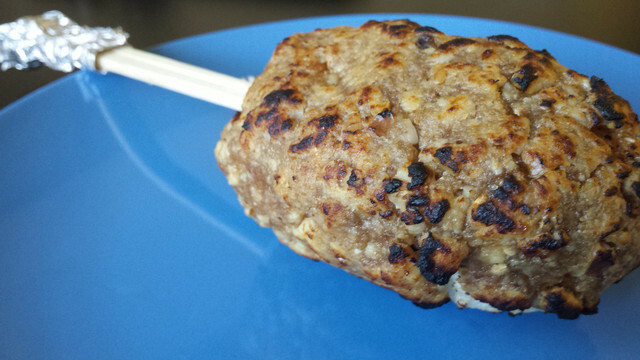 It needs to be this way to stick to the chopsticks properly. 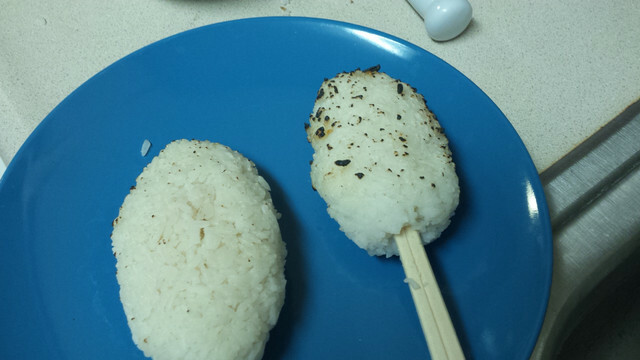 I had to rework the rice because I didn’t pound it enough at first to develop the stickiness. 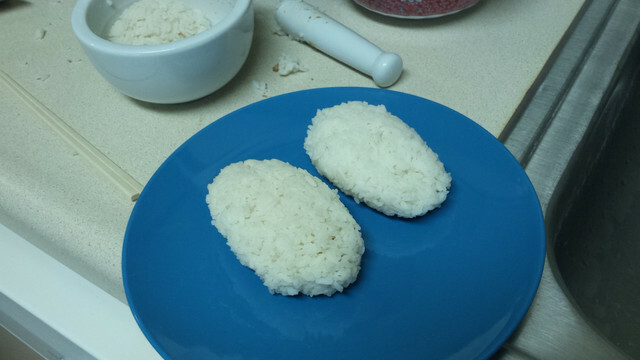 Then, form your rice into patties. Pack them together tightly! 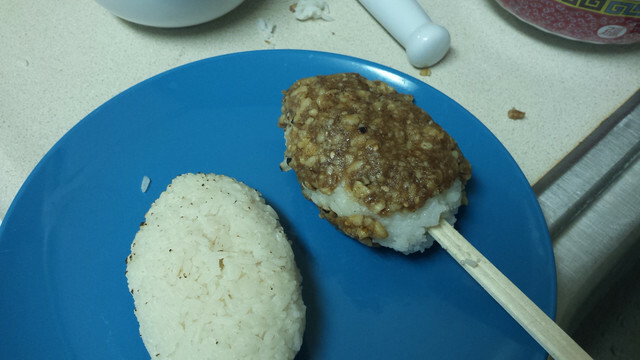 Then, spear rice patties through with chopsticks, and pack the rice around the stick, making sure it sticks well. Wrap foil around the end to make sure iti doesn’t burn over the open flame. Then, the fun part! Turn on your gas stove to a high flame. Lightly toast each side, about 30 seconds to 1 minute per side, or until you see toasty brown/charred bits. 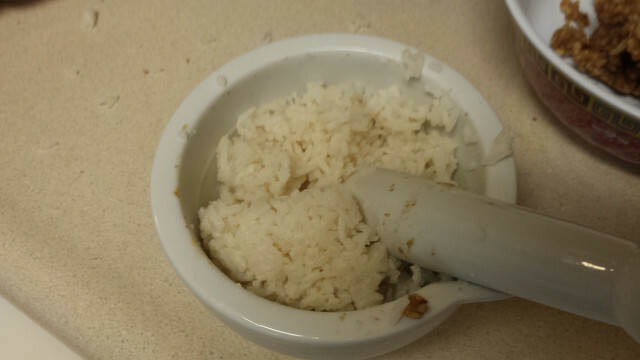 If you don’t pack the rice on tightly enough, it will fall off at this stage, potentially causing severe fire damage. Do not recommend. Make sure it’s securely on before you do this! 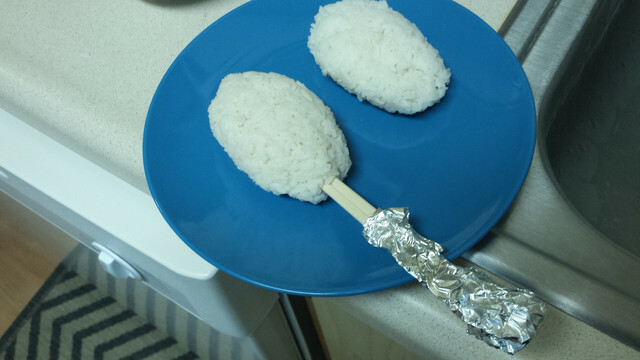 Then, taking the paste you made earlier, spread a thin layer over the surface of the rice. You might have to use your hands to spread it out. 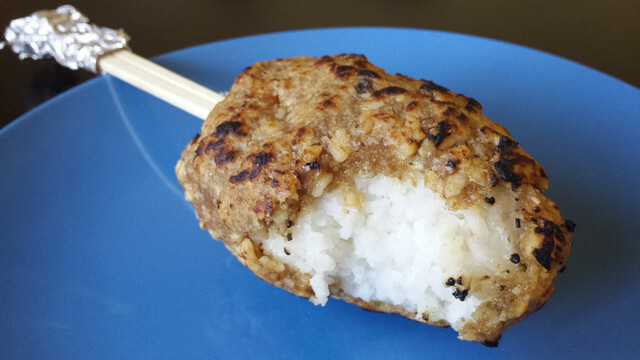 Like the rice, don’t be afraid to pack this in tight around the rice ball/stick. Make sure you get full coverage. I have no excuse here- I just got really lazy and left some parts uncovered. Then, again, toast this coating over the open flame, a few minutes on each side. I thought it would melt or slide off, but it stayed put surprisingly well! When done, plate up and get ready to eat. That’s it! Very easy to make, you don’t need a lot of tools, and most of the ingredients needed are easy to find around the house (if you’re used to cooking Japanese recipes). This is really tasty. The paste on the outside is salty-sweet, and the walnuts provide a nice mellow undertone that ties everything together, and elevates the rice so that it’s a nice combination of flavors. 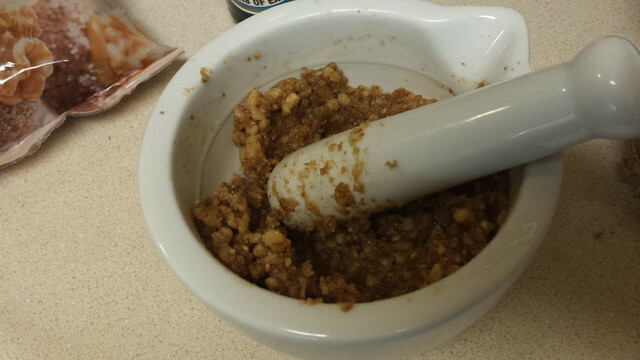 I was really surprised at how easy this was to make by hand, and even if you don’t have a mortar and pestle, I think this could still be accomplished with a bowl and something to pound the nuts and rice. I once used a hatchet to make something, so I’m all for being creative in your cooking tools.